THREE RECIPE E-BOOKS FOR $25.00! on how to download the pdf files. 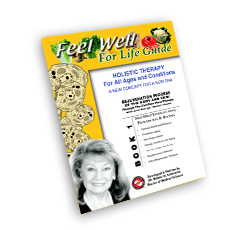 This book contains self-help instructions, procedures & recipes to rejuvenate the body and skin. Live Energy “Quick” Foods are used and how they work. Learn why a holistic approach is the best way to go. Learn how to: achieve optimal health and wellness, prevent premature aging, create greater energy and vitality. 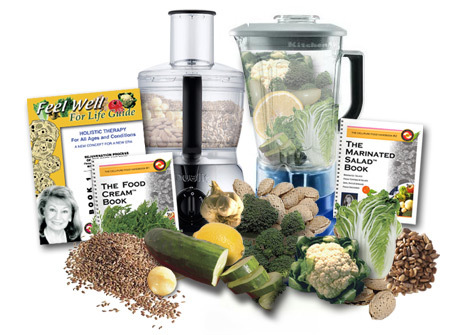 Control weight, obesity, reverse illness and degenerative diseases. This recipe book begins your Cell-Pure process with the addition of 7 or 8 varieties of fresh raw vegetables to your diet each day. 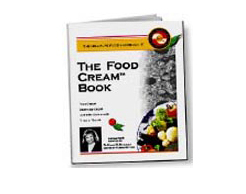 Normally this would be very time consuming, but the Food Cream concept makes this very easy to achieve. Food Creams are very easy to prepare and can be made right before using or prepared in advance and stored for up to 1 month. You will find that the addition of Food Creams to your daily intake of foods will increase you energy, normalize your weight and help your body will more fully utilize food supplements. All this without changing your regular diet unless, of course, you are on a customized program. This recipe book will show you an easy, delicious way to add another 7 or 8 more varieties of fresh, raw organic vegetables to your daily diet, making a total of 15 or more varieties each day. The fact is, we should be consuming 15 to 20 varieties of fresh, raw vegetables each day. With Food Cream and Marinated Salads, this is possible. 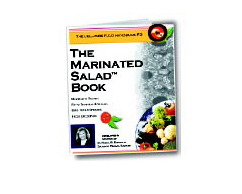 The book contains all the procedures to prepare and store raw vegetables to retain the nutrients for up to 1 month. Also included are recipes for delicious fresh salads, dressings, dips, pate, fresh toppings and condiments to add a variety of tastes to your foods. Again, no need to change your regular diet (unless, of course, you are on a customized program).